The Turner Brown Band. Photo: Supplied. For the first time ever, US/Australian collaboration, The Turner Brown Band will be performing in Canberra as part of their latest Australian tour. The Turner Brown Band is a joint collaboration between Australian slide guitarist and music producer Dom Turner (of awarded blues act Backsliders) and Ohio-based ‘Sacred Steel’ lap-slide guitar and vocal sensation Nikki D Brown. Having toured nationally to wide acclaim in 2017, the band will be making their ACT debut at Tuggeranong Arts Centre on Friday 3rd August. 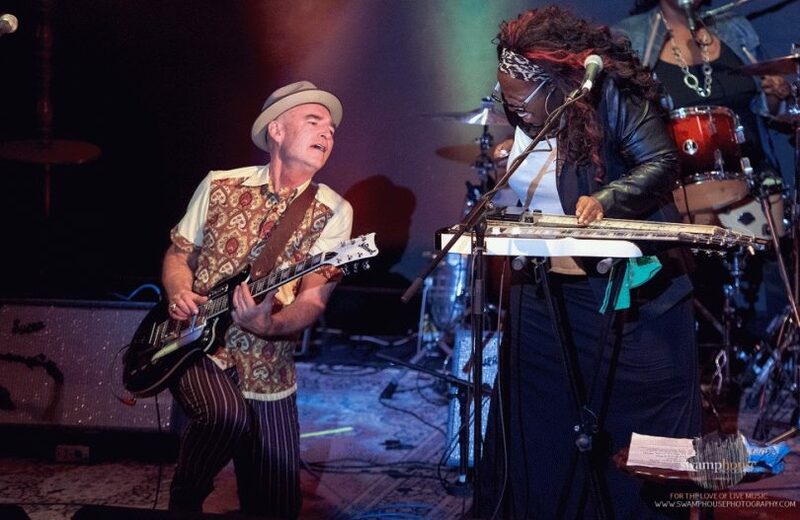 The band’s music is a merging of Nikki’s southern style US gospel ‘Sacred Steel’ guitar and vocals with Dom’s blues-based sounds, forming an eclectic and uplifting gospel-blues musical feast of duelling slide guitars. Dom Turner and Nikki D Brown performing live. Photo: Swamp House Photography. 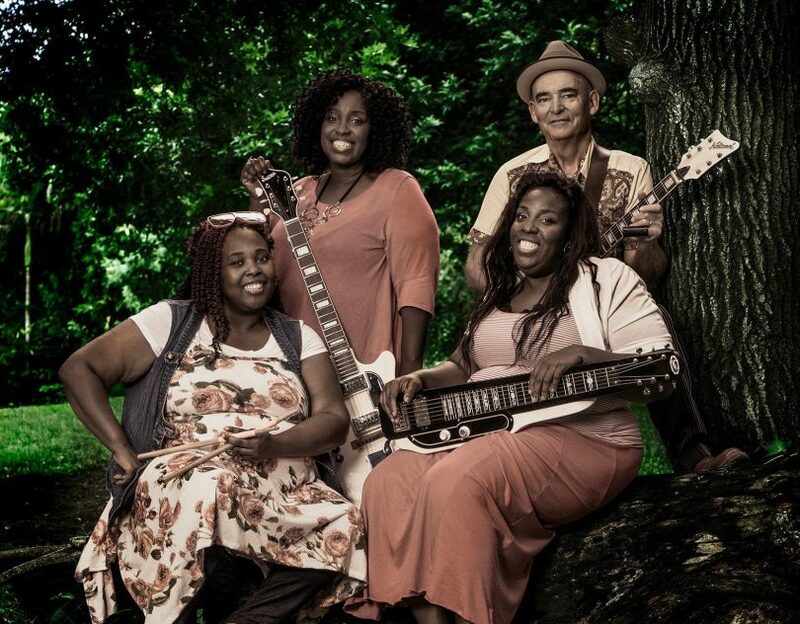 Nikki D Brown, born into a Church-based lap-slide guitar tradition known as ‘Sacred Steel’, learnt the instrument first-hand from myriad steel guitar masters including Ruth Durdel, Yolondo Ramsey, Del Grace and Henry Tyson, melding them all into her unique and wildly gritty guitar sound. Brown has been described by Guitar World as the “Jimi Hendrix of Sacred Steel” and is an electric lap steel guitar phenomenon. Her powerful vocals and performance have developed over a lifetime of gospel singing, resulting in a powerfully rich, raspy soul-gospel vocal style delivered with impeccable flare and flamboyancy. The band recording in a studio in Toledo, Ohio. Photo: Supplied.. Renowned Australian blues-based slide-guitarist and vocalist, Dom Turner has spent more than 30 years touring the festival circuit with Backsliders as well as various musical collaborations including Phil Wiggins & Dom Turner. 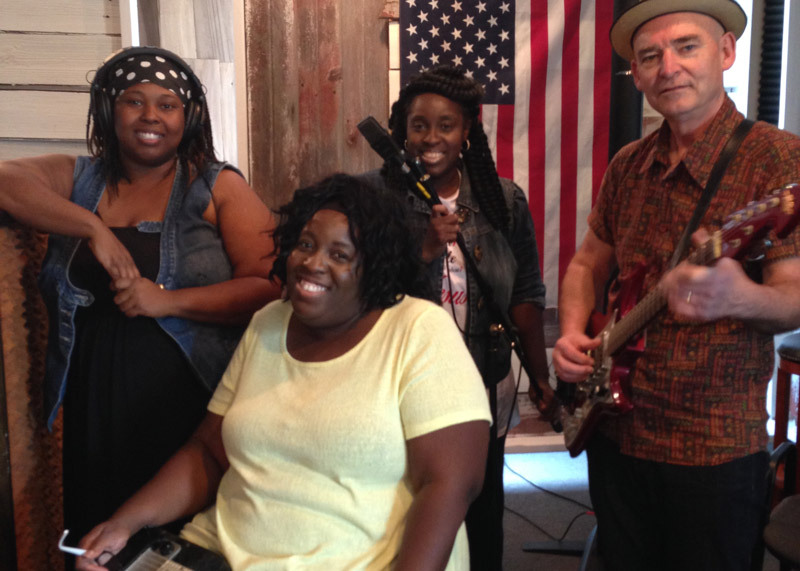 Joining Dom and Nikki are her sisters Gloria Brown (rhythm guitar and vocals) and cousin Tomika Webb (drums and vocals) who share the same deep musical heritage and love of infectious gospel-soul music. The Turner Brown Band debut follows three consecutive years of sell-out Backsliders concerts at Tuggeranong Arts Centre.